Happy Holidays from Ain’t Miss Bead Haven! We would like to wish everyone a very happy Thanksgiving and a joyous holiday season. You are receiving this message because you signed up for our mailing list at some point. If you no longer wish to receive our newsletters, please follow the ‘unsubscribe’ link in the footer of this message. We sincerely hope that you will stay with us as we bring new and exciting opportunities to downtown Mooresville. FREE Goodie Bag to the first 10 customers with a purchase of $75 or more. On Friday November 30, Ain’t Miss Bead Haven will be participating with all of the unique small downtown businesses in offering open house activities, light appetizers, store specials & more! Bring your favorite people and enjoy kicking off the holiday season in the heart of Mooresville. Ain’t Miss Bead Haven will be open late until 8PM every Friday during the holiday season starting on Friday, November 30. Come celebrate the holidays downtown from 6 – 8PM with live music, Santa visits, a life-sized snowglobe, wagon rides, lights, and more! Shop Downtown Mooresville’s many independently-owned retailers for one-of-a-kind gifts that will delight even the toughest critic on your list. Dine in our locally-owned restaurants and desserteries, or stop at any of our unique watering holes – all sure to please any food mood or quench any thirst!! Downtown is where it’s at! 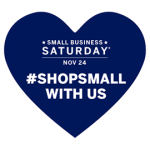 Previous: Celebrate Small Business Saturday! Next: Sale on December Classes – Soldering, Fold Forming and More!